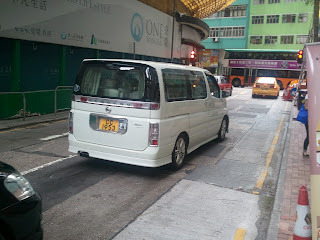 Waiting in Wanchai market the other day, I spotted this piece of Hong Kong-style parking. Yes, I know it looks as though CC 1953 is driving through, but he really is parked like that. I was almost tempted to park between him and the kerb! Obviously the mainland number plate fell off, cant be a HKer. I`m trembling in fear at the though of those 100 who can`t drive crossing the border each day. "tempted to part between" whatever paddles your canoe. Oh, bugger! The original typo was "parkt" and I "corrected" the wrong letter.